As time goes by, it’s easy to fall into the trap of thinking that it’s “too late” for certain opportunities. 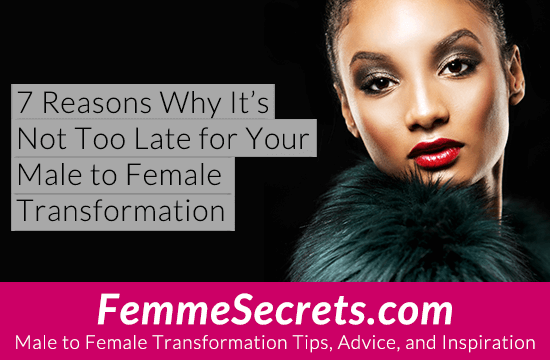 Have you ever thought that it’s too late for you to step out en femme, begin your transition, or simply look as beautiful and feminine as you feel on the inside? I firmly believe that it’s NEVER too late to pursue your feminine dreams. No matter what your age or situation, there’s no better time than now to express your fab femme self. Keep reading for 7 reasons why it’s NOT too late for your male to female transformation! From Laverne Cox (transgender actress and advocate) to Danica Roem (first transgender woman to win a state seat), there are more transgender women in the public eye than ever before. What better time to join these role models in spreading awareness? Sure, we’d all love to look 22 forever. But age comes with some pretty great perks – namely wisdom and experience. There’s nothing that can’t benefit from a dose of wisdom and experience, including your male to female journey. Despite our youth obsessed society, there are so many gorgeous female icons in their 40s, 50s, 60s, 70s, and beyond. Jennifer Lopez, Christie Brinkley, Helen Mirror, Raquel Welch, and countless others prove that there’s no expiration on beauty and femininity. The older you get, the less you care about what others think of you. (Remember all those dramas in high school?) It’s incredibly liberating to let go of caring about the opinions of others. Top designer Vera Wang began her fashion career at age 40. Julia Child published her first book at age 39 and made her TV debut at age 51. Laura Ingalls Wilder (author of “Little House on the Prairie”) published her first novel at age 65. Anna Mary Robertson Moses (better known as Grandma Moses) began her painting career at age 78. In 2006, one of her paintings sold for $1.2 million. One day you will look back at your life. Would you rather have lived fully (and perhaps rustled a few feathers in the process) or be filled with regrets? The choice is yours to make TODAY. 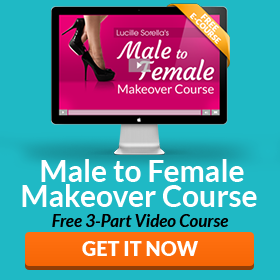 From transgender and crossdressing support groups, websites, books, and services – to specialized products and procedures – there are more resources than ever that can benefit your feminine transformation or transition. Check out the Transgender/Crossdressing Resources page of this site for some ideas! I hope this short post has convinced you that NOW is the perfect time to pursue your feminine dreams – whatever that might mean for you. It is absolutely not too late! I’d love to hear your thoughts on this topic, so please share a comment below! Porque no se publicó mi comentario del 13 de marzo de 2019? Me decía una nota que se estaba duplicando el comentario cuando hace mucho tiempo no hacía comentarios con uds. I’m about to turn 51 and just started getting back to crossdressing after a 15 year hiatus. I cry sometime when I think about those wasted years of not admitting to myself and the world who I am. I can’t get those years back, but I can make the most of the time I have left. I totally agree wit you Renee. It`s natural to regret the wasted time, but it does not help.